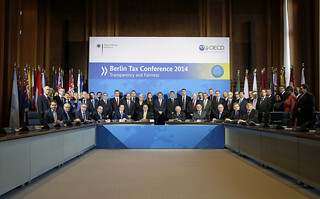 Since the Berlin signing ceremony on 29 October 2014, a total of 61 jurisdictions have signed a multilateral competent authority agreement to automatically exchange information based on Article 6 of the Multilateral Convention. The significance of the agreement was demonstrated by the participation of 39 ministers in the first signing ceremony in Berlin and the signing ceremony held in margins of the OECD Ministeral meeting (MCM) in Paris in June 2015. The competent authority agreement is a multilateral framework agreement, with the subsequent bilateral exchanges coming into effect between those signatories that file the subsequent notifications under Section 7 of the agreement. The agreement specifies the details of what information will be exchanged and when, as set out in the Exchange of information. Section 1 contains the definitions of the terms used in the agreement. Section 2 sets out the information to be automatically exchanged. Section 3 sets out the timing and method of the automatic exchange of information. Section 4 outlines how the parties to the agreement will work together to ensure compliance with the agreement. Section 5 sets out provisions to ensure confidentiality and the safeguarding of the data. Section 6 sets out the process to consult on ensuring the smooth operation of the agreement and to amend the agreement. Section 7 sets out the subsequent notifications required under the agreement and how the agreement is then subsequently brought into effect. Section 8 sets out the role of the Secretariat. » Read the press releases on the OECD MCM Paris signing ceremony (June 2015), the Berlin signing ceremony (October 2014), the Swiss signing (November 2015), and the Ghana and the Seychelles signing (May 2015). » Read the full text of the multilateral competent authority agreement. » Watch the interview with Achim Pross (OECD) who comments on how effective the new rules may be against tax evasion. For further information, please contact Achim Pross (Achim.Pross@oecd.org), Head, International Co-operation and Tax Administration Division, Centre for Tax Policy and Administration.